Vernon Corea, Sri Lanka's pioneering broadcaster, died on September 23rd, 2002 aged 75 years. 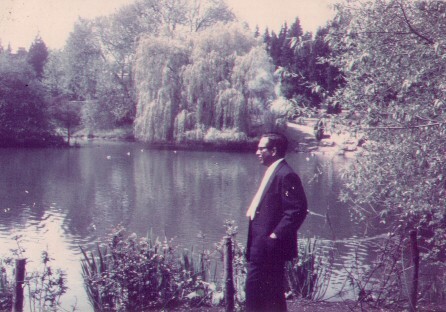 Vernon lived in New Malden in Surrey. The previous night,on Sunday 22nd September, he watched BBC News 24 and went to bed. In the morning he had passed away in his sleep. It was a peaceful departure from this world. Vernon was born in Kurana, Katunayke on September 11th, 1927. His father Rev. Ivan Corea was a curate at the St.Phillips Church in Kurana in 1927. The Corea family are descendants of Dominicus Corea who was crowned King of Kotte in the 16th century. 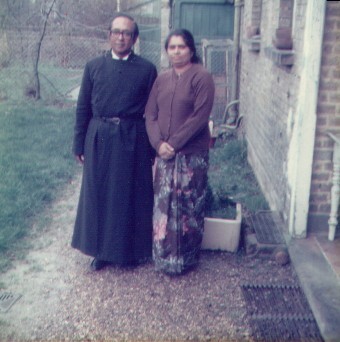 Vernon's parents were the late Canon Ivan Corea and Ouida Corea, one time Rural Dean of Colombo of the Church of Sri Lanka and Vicar of St. Lukes Church, Borella. 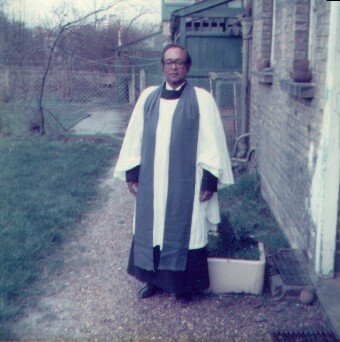 In the late 1950s Canon Corea was appointed Vicar of St.Paul's Milagiriya. 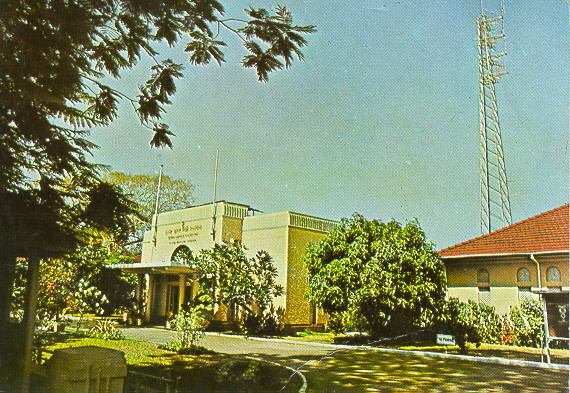 Vernon was educated at Royal College, Colombo where he played a full role in the life of the school - from debating society to playing tennis. He was also educated at Bishop's Theological College in Calcutta, India but decided not to pursue ordination. 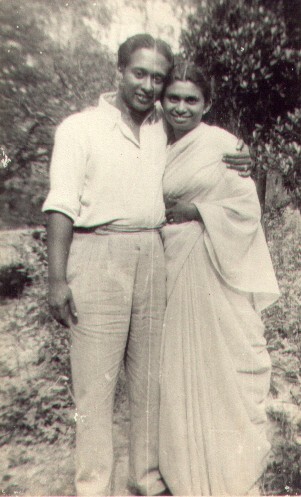 Vernon Corea returned to Sri Lanka and went into teaching at Uva College, Badulla in 1953 where he met his wife, Monica, who was also a teacher. 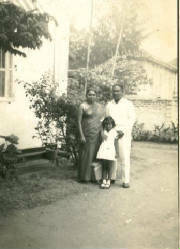 After the death of their first born son Harishchandra, Vernon and Monica moved to Colombo. He worked briefly for Car Mart and then joined Radio Ceylon as a Relief Announcer in 1956. Vernon was appointed as an Announcer in Radio Ceylon in 1957 by the Director of the Commercial Service, Clifford R.Dodd. Vernon had the joined the 'greats' - Livy Wijemanne, Pearl Ondaatje, Tim Horshington, Greg Roskowski, Jimmy Bharucha, Mil Sansoni, Eardley Peiris,Shirley Perera, Bob Harvie, Chris Greet, Prosper Fernando, Ameen Sayani (of Binaca Geet Mala fame), S.P. Mylvaganam (the first Tamil Announcer on the Commercial Service), H.M.Gunasekera to name a few. They blazed a trail in broadcasting in South Asia. 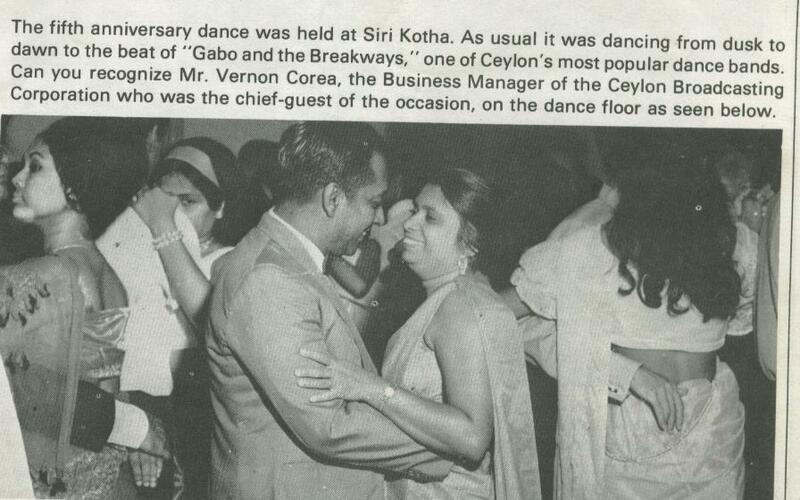 Vernon also worked with the legendary Karunaratne Abeysekera, they were very close friends. People from all over the Indian sub-continent stayed awake into the wee hours of the morning to listen to the announcers from Radio Ceylon. Fan mail flooded from all over South Asia. Radio ruled the airwaves in the 1950s and 1960s. Television hadn't even arrived in Ceylon. Announcers like Vernon were the pioneers of public service broadcasting in Ceylon. Vernon took to radio like a duck takes to water and his career spiralled upwards. He soon established himself as a popular Announcer of Radio Ceylon. Everyone is South Asia loved Radio. Announcers were the 'pop stars' of that generation and Radio Ceylon occupied a very special place in the hearts of South Asians in India, West Pakistan, East Pakistan, Maldives, Nepal, Bhutan and there were listeners even in Burma. Salman Rushdie mentions Radio Ceylon in his novel 'Shame.' People in India remember the radio station with such affection. Vernon presented some of the most popular radio programmes in South Asia: Two for the Money, Kiddies Korner, Old Folks at Home, To Each His Own, Ponds Hit Parade, Saturday Stars, Take it or Leave It, Maliban Bandwagon (Maliban Show), Roving Mike, Dial-a-disc, Holiday Choice, Sunday Choice and many more. Vernon was also a sought after compere of countless dinners, dances, events and he was at the helm of many a New Year celebration and his voice greeted listeners with a cheerful 'Happy New Year,' in the 1960s and 1970s. He introduced Mignonne Fernando and the Jetliners onto the stage at the popular 'Cocount Grove' in the Galle Face Hotel in the early sixties. The manager of The Jetliners, Tony Fernando, knew Vernon so well. Vernon has compered so many varied shows from events for the Army, Navy and the Ceylon Air Force to a dinner dance in Chilaw. Vernon travelled the length and breadth of Sri Lanka - he soon became a household name on the island. Vernon was called upon to present the first ever experimental television broadcast from Colombo in 1972. These were the first tentative steps into the world of television.He appeared in the first grainy pictures on the television screen presenting the first experimental tv program in Colombo. The legendary Director of the Commercial Service, Clifford R.Dodd wrote to Vernon on 17th September 1957 to inform him that he had been 'placed on the panel of Relief Announcers in English on the Commercial Service with effect from September 1st, 1957.' This was the beginning of Vernon's amazing career in broadcasting in Ceylon. Vernon was paid the princely sum of Rs 1/75 per hour, subject to a maximum of Rs. 12 per day.Many regard Clifford Dodd, as the father of commercial broadcasting in Sri Lanka. 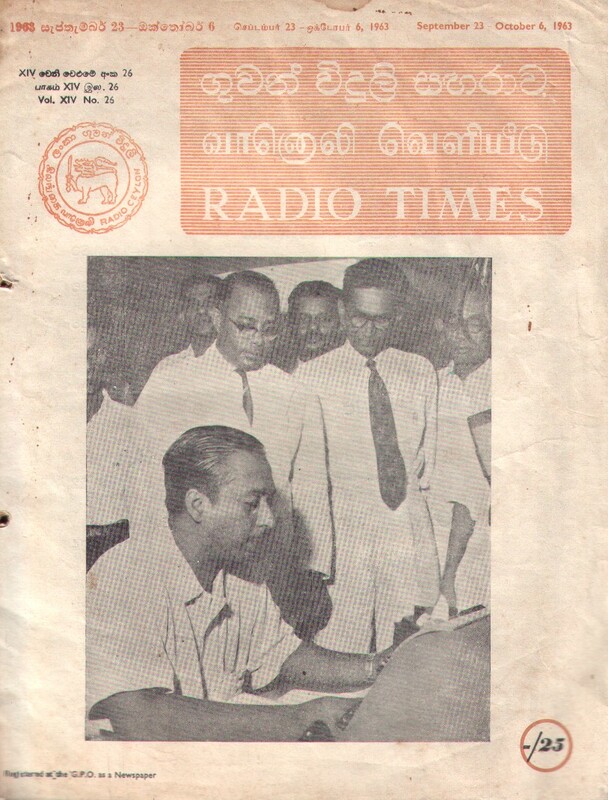 Commercial broadcasting from Radio Ceylon was inaugurated on September 30, 1950 and Clifford Dodd was seconded for service via the Colombo Plan. 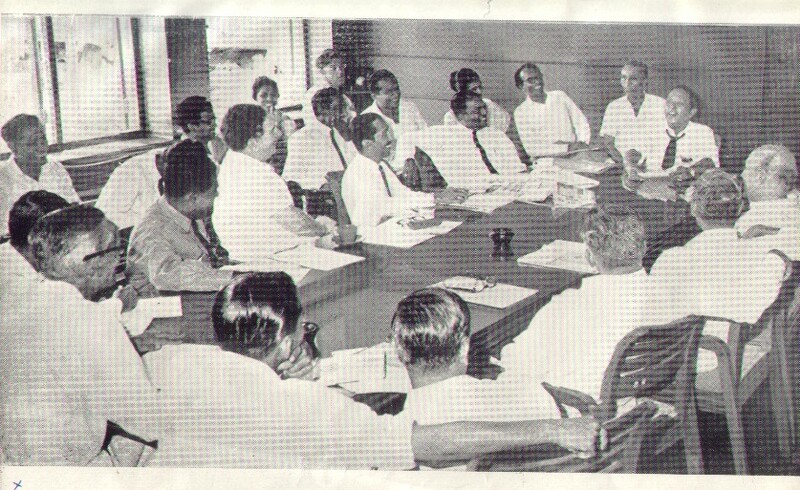 Dodd was charismatic and innovative and there was a real 'buzz' in Radio Ceylon after his arrival. South Asian leaders and ministers of the British Commonwealth, including India's Jawaharlal Nehru, Ceylon's J.R. Jayawardene and Ghulam Mohammed, decided that Asia needed something like the Marshall Plan that had just helped rebuild Europe after the ravages of war. The Colombo Plan, which resulted from these deliberations, was the first multilateral effort in foreign aid in Asia. The key donor countries were Australia, New Zealand, Canada, Britain and the United States, and the organisation included Asian members of the Commonwealth like India, Ceylon and Pakistan. Australia sent Clifford.R.Dodd to Radio Ceylon under the 'Plan' and it was a 'ground breaking' experience, as far as broadcasting in Ceylon was concerned. Clifford Dodd was a source of encouragement and inspiration to Vernon Corea who started his career in radio at the bottom of the ladder but he soon climbed up - Vernon was appointed Announcer from 1958-1959, Programme Assistant from 1959-1968, Business Manager from 1968-1974 and he was appointed Director News of the Sri Lanka Broadcasting Corporation in 1974. Vernon spent six months in England from 29th April 1970 following a course of training in Broadcasting Management under the Imperial Relations Trust at the British Broadcasting Corporation. He was instrumental in introducing Sinhala music into the English Service. Together with his cousins, Sangabo Corea and Vijaya Corea he made Clarence Wijewardene, Annesley Malawana and other talented Sri Lankan musicians, household names. He had an influential EMCEE column in the Daily News in the 1960s and 1970s and many musicians went to see Vernon, in order to publicise their group. It was a huge plus to be featured in the EMCEE column of the Daily News. Vernon has also mentored the great Sri Lankan radio names of today, including his cousin Vijaya Corea and Nihal Bhareti. 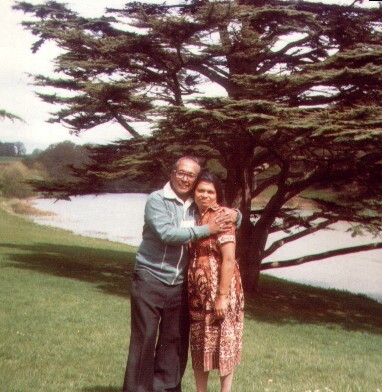 The family moved to England in 1975 when Vernon and Monica became the first Asian missionaries at the Worldwide Evangelization Crusade founded by the all England cricketer C. T. Studd. They worked for the radio arm of WEC, Radio Worldwide who were stationed in Upper Norwood South East London at the time. After a spell in religious broadcasting Vernon was invited to present the first ever Asian programme in English. "London Sounds Eastern" on BBC Radio London. Vernon's record selection included Sri Lankan hit makers - Clarence Wijeywardene, Annesley Malawana, Dharmaratne Brothers, La Ceylonians, Indrani Perera, The Gypsies, Dalrene, Sam The Man, Mignonne Fernando and the Jetliners, Desmond de Silva , Nimal Mendis and many more - they were reaching the heart of London through the airwaves. Many of these musicians were featured on Vernon's radio programs at the Sri Lanka Broadcasting Corporation. This was certainly a first for the Sri Lankan Community in the UK and other Asian Communities. Vernon paved the way for radio programs in English involving Asian culture, Asian music and personalities. The programme was very successful and Vernon interviewed Pandit Ravi Shankar, Pandit Amaradeva, Asha Bhosle, Usha Uthup, Lata Mangeshkhar, Clarence Wijeywardene, Annesley Malawana,Nimal Mendis, Reginald and Jamila Massey, His Excellency the President of Sri Lanka among a whole host of distinguished personalities. "London Sounds Eastern" built up a huge following and Vernon was reaching new audiences across the capital, he was even featured on the pages of the BBC Radio Times along with Alex Pascall. Vernon was supported by key BBC producers like Keith Yeomans during this time - they were working with a very talented man from Sri Lanka. Vernon covered the Royal Wedding of His Royal Highness Prince Charles, the Prince of Wales to Lady Diana Spencer for the Sri Lanka Broadcasting Corporation and he voiced news reports onthe visits of President J.R.Jayewardene and Prime Minister Ranasinghe Premadasa to the UK. He was invited to Buckingham Palace to meet the Prince of Wales who has a special interest in Asian culture. 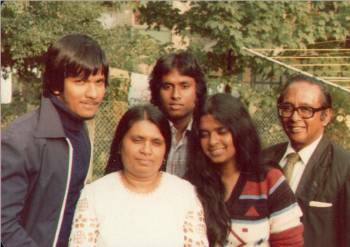 Vernon took up the post of Asian Programmes Officer at the BBC, he was in the forefront of training people from the minoritiy ethnic communities - this was a first for the BBC in terms of Local Radio. He was the first Sri Lankan to be appointed to senior management at the BBC. 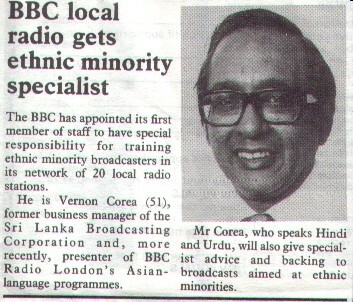 In 1978, Vernon Corea was appointed as the first Ethnic Minorities Adviser for the British Broadcasting Corporation and held it until his retirement. The BBC were trying to be more inclusive and Vernon brought with him a whole new picture within Britian's multicultural mosaic. Vernon valued diversity and he certainly changed views at the BBC. His appointment to the BBC was heralded by the 'Thunderer' the London Times, the Daily Telegraph and the Financial Times in the United Kingdom.The introduction of the BBC's new Asian Network is largely due to the pioneering work carried out by Vernon - in the late 1970s and 1980s. Vernon was a committed Christian, his faith in God and the Lord Jesus Christ was non-negotiable. He had a deep and abiding faith in Christ. The joy of the Lord was Vernon's strength. He was a man who was not depressed or down and he attributed his state of well-being to Jesus Christ. He used to always tell his children, 'take it to the Lord.' Vernon was a Lay Reader at Christ Church in Gipsy Hill, South East London and also at Emmanuel Church in Wimbledon Village in South West London. Vernon has left a magnificent legacy to Sri Lankan and British Broadcasting with 45 years of service to public service broadcasting. The London Times (8th October 2002) and the London Guardian (October 15th) paid tribute to the pioneering work undertaken by Vernon Corea who has been dubbed. "The Golden Voice of Radio Ceylon......"
With 520,000 autistic people in the UK and 30,000 in Sri Lanka, Vernon supported the Autism Awareness Year campaign launched by his son and daughter-in-law. He leaves his wife Monica, his children Ivan, Vernon and Ouida. He was the father-in-law of Charika, Fidelma and Praveen and he adored his grandchildren Charin, Rohan, Mark, Emily, Rebecca, Jeremy and Rachel. His granchildren had a very special nickname for him, they all called him 'Ga-Ga,' Vernon loved it and he linked it to Freddie Mercury and Queen's hit song ,'Radio Ga Ga,' it became Vernon's theme song in the family and he loved it. 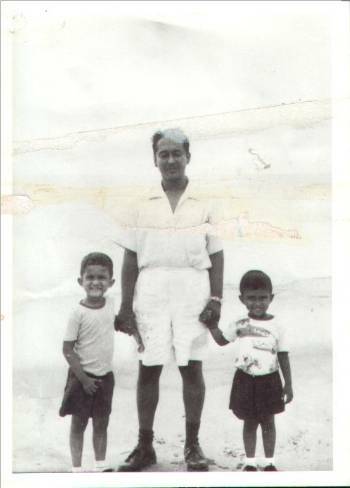 Even when he was in Sri Lanka, Vernon was very much a family man. His children recall the simple pleasures of life, visits to the Savoy, the Liberty, the Majestic, the Rio to see great movies like the Sound of Music, My Fair Lady, Mary Poppins, Chitty Chitty Bang Bang, Hatari....hot dogs at the Fountain Cafe....The Royal-Thomian cricket match....a stroll down Galle Face Green...a wonderful meal at the Chinese Lotus Hotel in Colombo. 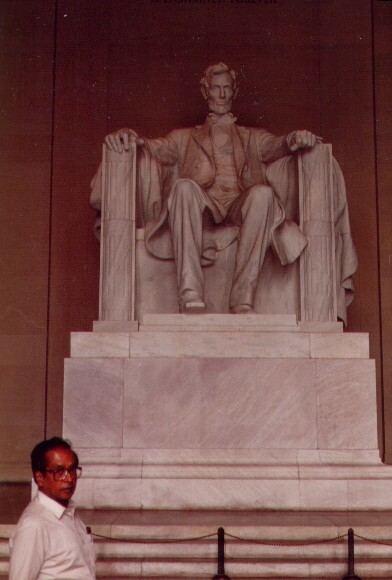 He will be missed by so many - Vernon was an accomplished jazz pianist - he played by ear - on one occasion, Vernon was asked to play some of the old songs by Dudley Senanayake, the Prime Minister of Ceylon. Members of Dudley Senanayake's Cabinet, including J.R.Jayewardene and Shirley Corea, gathered around Vernon, at a party, in a flat in Galle Face Court, in Colombo - singing all the old favourites. Duke Ellington, the great Jazz pianist visited Ceylon in the 1960s, he was whisked to the studios of Radio Ceylon for a recording and he met Vernon (who had taken along his sons to meet the great man). 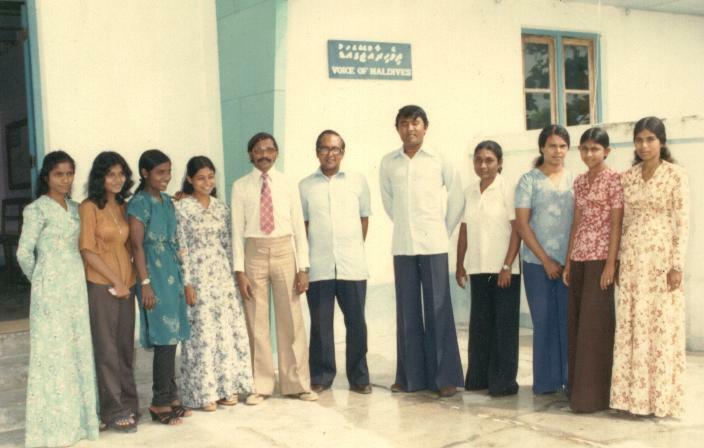 Vernon was deeply loyal to the employees of the Sri Lanka Broadcasting Corporation. On one occasion an employee could not afford to hire a music group for his wedding. So Vernon gathered together some friends who were musicians and members of his family and they played a six hour session at the wedding - the guests danced to 'Blue Moon' and other songs of yesteryear.
' In many respects Vernon represented a dying culture. In the best sense of the term he was essentially a Public School boy, a typical product of Royal College of the pre-56 vintage. His sense of loyalty to his management and to his profession and his compassion and concern for those who worked under him were exemplary. I recall many instances when he would intercede on behalf some hapless subordinate who had fallen foul of the management without ever flinching from his loyalty to the latter. He loved music, whether it was playing the piano, the melodica or the violin - there was music in his house - in Maha Nuge Gardens. Vernon and his brother Ernest always provided the entertainment - there was laughter, songs, jokes in the Corea household. They were very special times for the family in Colombo. 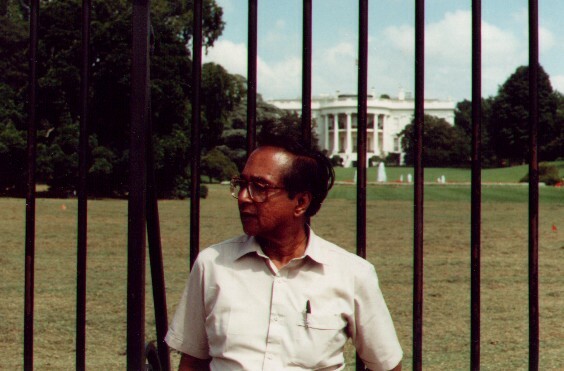 Vernon's brother, Ernest, was Sri Lanka's former Ambassador to the United States of America and one time Editor of the Daily News, one of the oldest newspapers in Sri Lanka. The Corea brothers held sway in print and radio reaching the top in the media. They were both very influential at the time. 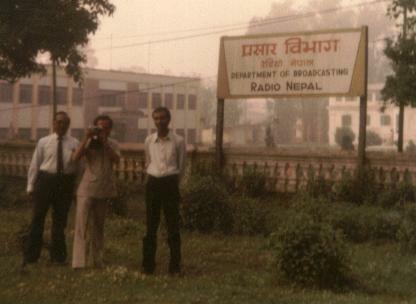 An opportunity to train broadcasters in South Asia came to Vernon in the 1980s and he visited countries in the SAARC region such as Bangladesh and the Maldives. He met the President of the Republic of Maldives Maumoon Gayoom on one of his visits.